Diet and nutrition has never been easy than using an online calorie calculator to count calories instead of looking at boring calorie tables. Food nutrition and more. As irreplaceable as counting calories is to your diet for weight loss, it always helps to have the right tools such as a daily calorie intake calculator using meal information to count calories to exact precision to make things easier. A few days ago Slism came out with an online calorie calculator of its own releasing a web tool for easy calorie calculation and food nutritional facts to get you down the road on a healthy diet. 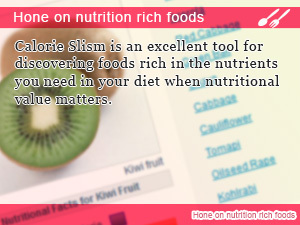 With Calorie Slism you are able to look up whole food nutritional information need to know more details and gain insight on health foods to eat. Diet and nutrition info for healthy eating that gives you more than counting calories. It's more than a calorie counter, it's a nutritional calculator. 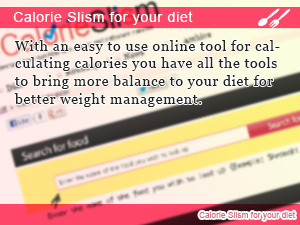 Go here to start using Calorie Slism to calculate calories to lose weight and get whole foods nutritional information right away. Once you start to calculate total calories pulling up detailed nutritional info and exercise required to burn calories, will be on the right track in your diet in no time. No more problems trying to figure out the calorie content of food and how to calculate calories online! All you need is to search and add to your list. That's it! It's easy than shopping. How many calories in food? No problem! Calculate the total calories in the food you eat with ease, no hard to use operations necessary. Quickly add items to your list and have the cumulative calories calculated for you automatically making calorie counting that much easy. Start a healthy diet on nutrition food with healthy food to eat. Get all the nutritional value of foods on one page. View a complete summary of food nutritional information combined into one easy to understand page all in one click. Let's go into more detail on How to Calculate Calories. 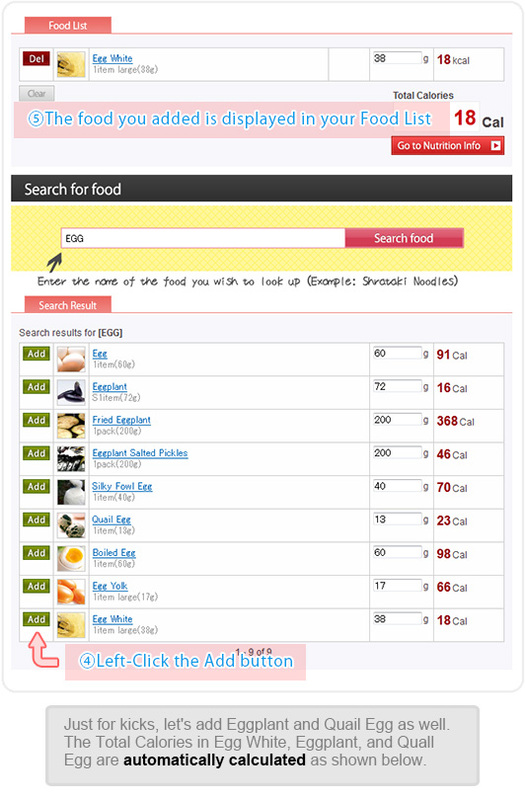 The search bar for Calorie Slism is an easy tool that allows you to search for food calories just by typing the name of the food you wish to look up and click Search food! It's so simple you can just say you can tell someone to search food it. 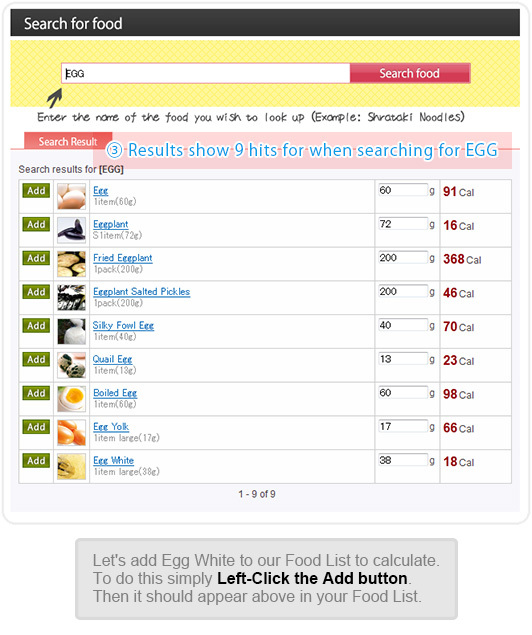 Intuitive to use as it is you can save time looking up calories in food. Hope you find what you're looking for! Search Results Get Listed Below Instantly! After entering the food you wish to lookup calories for a list will be displayed showing the calories in foods you are looking up including similar foods to be either viewed individually or added to your Food List. In our case, we are searching for the calories in eggs so as expected food items with egg in them appear bellow. Wow, there are 9! I think we are getting somewhere. It Shows Up In Your Food List Right Away! One feature that makes Calorie Slism such a helpful tool in calculating calories in your daily meals is the ability to add foods you wish to calculate calories for to your Food List, where all items are stored after adding before calculating total calories, which you will in the next step in calculating calories. Calculating the cumulative calories for all items in your food is as easy a one click. Once you are ready to calculate total calories all you have to do is lick on the button labeled Go to Nutritional Info to get started. 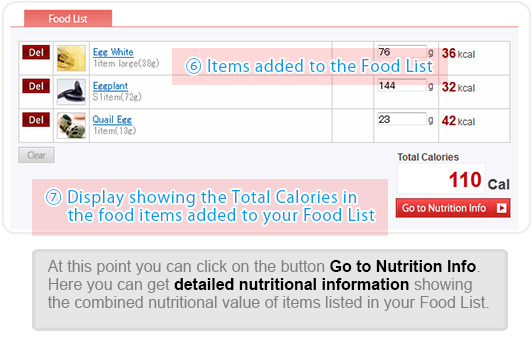 After clicking this button, a page showing the total amount of calories in the items selected in your Food List along with detailed nutritional information will appear. How was that for your first time calculating calories with Calorie Slism? Although there may other aspects of calorie calculation that would aid you in easy calorie counting, we will be including more instructions on how to calculate calories in the near future. Until then this should be enough to get your started calculating calories. If you liked this tutorial on how to calculate calories, please feel free to look around and use Calorie Slism for your daily calorie counting and nutritional lookup needs. Start calculating calories right away! With an easy to use online tool for calculating calories you have all the tools to bring more balance to your diet for better weight management. 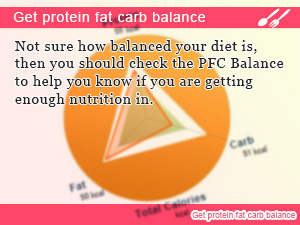 Not sure how balanced your diet is, then you should check the PFC Balance to help you know if you are getting enough nutrition in. Calorie Slism is an excellent tool for discovering foods rich in the nutrients you need in your diet when nutritional value matters.